When I look back at the highlights of this weirdly action-packed summer, I feel a sense of accomplishment from successfully whittling away at a bucket list…. There is a special sense of satisfaction, however, that comes with doing things you never intended, hoped, or signed up to do, and then doing them well. If this list looks familiar, please step forward to claim it. It’s mostly done, so, you’re welcome. Every day, people go to fabulous exotic places with backpacks, sarongs, and well-worn passports. Maybe they’re off to climb a peak, or swim to a hotel room that sits on stilts in the middle of a crystal clear lagoon. Maybe they’ll pet a sloth, or drink tea with a prince on the balcony of a palace. No? That’s not what happens immediately upon crossing the border? My obvious international inexperience also extended to not knowing how to change money, or use a passport. 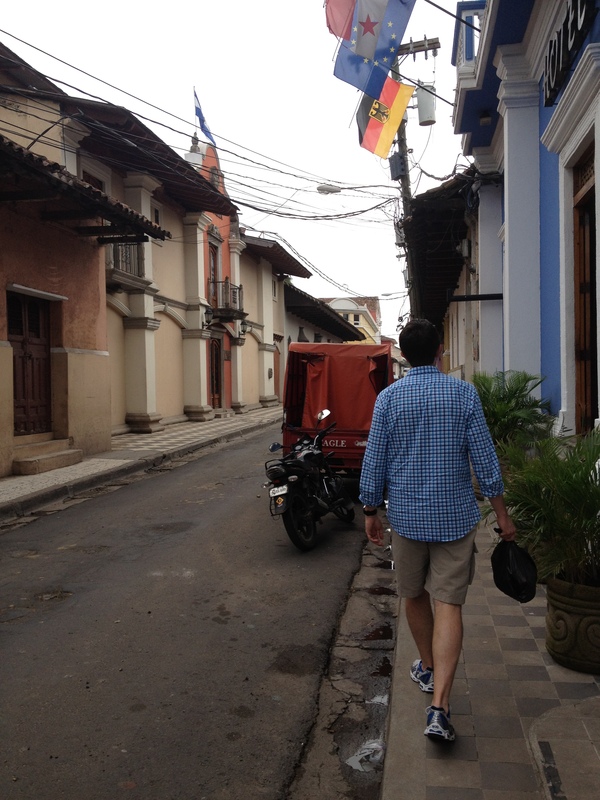 I knew how to take a cab – but I didn’t know how to take a cab in Nicaragua. Nicaragua – the exotic-to-me locale where our dear, smart, hyper-educated, beautiful, world traveling friends had decided to get married. We’d known them forever, and I’d been not-so-secretly hoping they would finally get hitched. What happened to getting married in Vegas? Or Palm Springs? Palm Springs is nice. I thought my first trip abroad, might be to, say…. Canada. Not like faaaar into Canada – I’m not crazy – I was thinking maybe the part of Canada that touches Washington. My husband John was not nervous at all. He’s traveled far more than I, and in more precarious situations than our loungey, celebratory jaunt to the Tropics. John came home a few nights before we were to leave, and could see it on my face. Here’s what happened instead of us getting kidnapped: Our trip to Granada, Nicaragua – a Spanish provincial town from the 1500’s that smells eerily like the Pirates of the Caribbean ride at Disneyland — was notably machete-free. We met amazing people who’d traveled from near and far to celebrate a couple we all love; the weather was warm and the people of Granada were kind, and lovely. The trip turned out fine. Not just fine, but fun. Like really, really fun. Even the part where my hair frizzed out to three times its normal size. 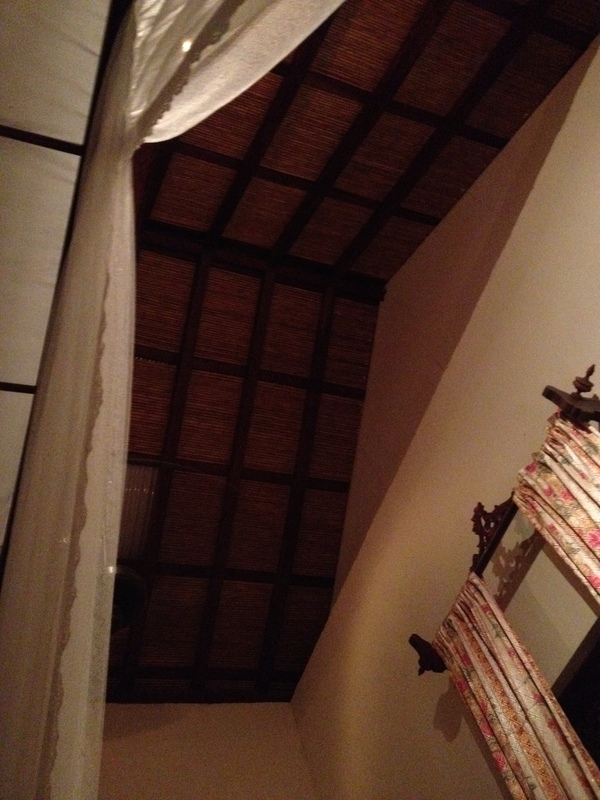 After traveling safely from the airport, we settled into our Indiana Jones suite – huge vaulted ceilings, wrought iron fixtures and a mosquito netted, four-poster bed. He did stay hidden, and I’ve never been such a picture of efficiency in the lavatory. I stomped into the bathroom on every subsequent trip, hoping to scare away any critter that may have already called dibs on the bathroom. It was a full 24 hours before the little green lizard and I came face to face. My fear was replaced with pity as I realized he was just minding his own beeswax when he got stuck in a bathroom with a terrifying giant sorely in need of a deep conditioner and a flat iron. 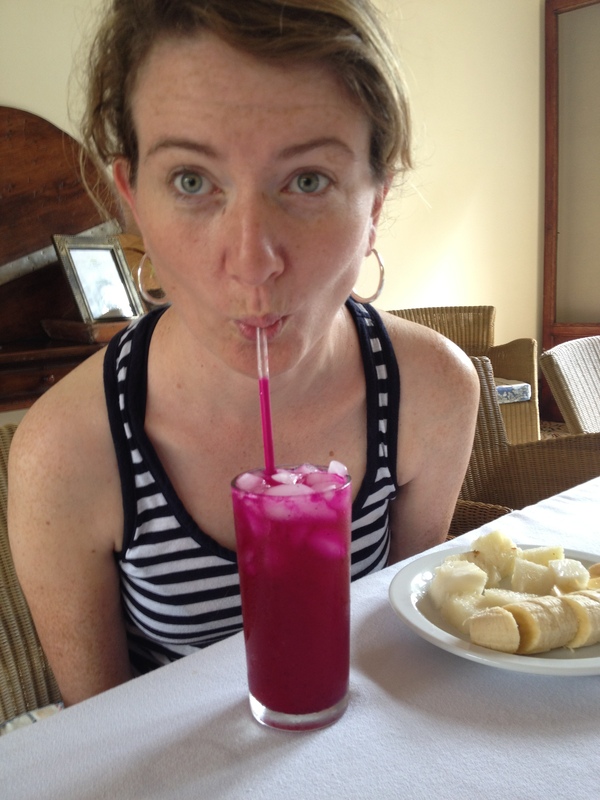 Each morning of the trip, John and I shuffled to the hotel dining room where Olga, whose dewy skin and bright smile belied her age, presented us with a new exotic juice, tropical fruit, and huevos-anything-you-want. She was patient with my Spanish as I said the eggs are very good, and the birds are very pretty, and the trees are very pretty, and the table is very pretty. And every day, Olga suggested to us that our family would only be complete once we had a daughter. Either that, or she was saying her family is complete because she has four daughters. If only my college Spanish teachers, who I in no way remember, could see me now! Unlike Spanish class, not once did I get to ask someone how to get to the library. Our trip to Nicaragua was a four-day fiesta punctuated by naps and mosquito bites, and of course, the tear-jerker wedding and five-hour dance party reception that concluded with grown men jumping into the swimming pool fully dressed – John included. I stood next to my college roommate as her boyfriend Jesper jumped in. Liane and I hemmed and hawed. “Should we jump in? We should, we should totally do it. I don’t know. Yes. No. Yes, let’s do it.” By the time we got to “OK, we’re totally doing this.” It was over, the guys were climbing out, and I did not have to transport a soaking wet dress back to the United States in my carry-on. But still, I’ve never been closer to jumping into a pool while wearing a dress. So, progress. # 5 Be glad I went to my 20-year reunion, and come to terms with the fact that high school was actually pretty OK. Buoyed by my arm-candy husband and old friends who met us in the parking lot, we went in. Sure, the evening had its awkward moments – even painfully awkward moments with stilted conversation or that thing where you don’t recognize or remember someone in the slightest – but most of the moments were hilarious, sweet, fun, or wistful. Everyone had changed…but not really. While the 10-year reunion had an air of one-upsmanship, the 20-year came with the acute but unspoken sense that time was now starting to go by too fast, so we should just enjoy ourselves. Some classmates had passed away, many had moved away, and it seemed that everyone recognized we simply don’t have the luxury of time to compete, judge, be intimidated, or hang onto whatever baggage we’d brought from high school. We’re all just people, with a little bit of shared history – just like we were in high school, before we had the wisdom and sense to realize or appreciate it. If given the chance, go to your reunion – it’s not the same as Facebook. *The photos at the tippy top are hopefully illustrative enough to make sense: Nicaragua. 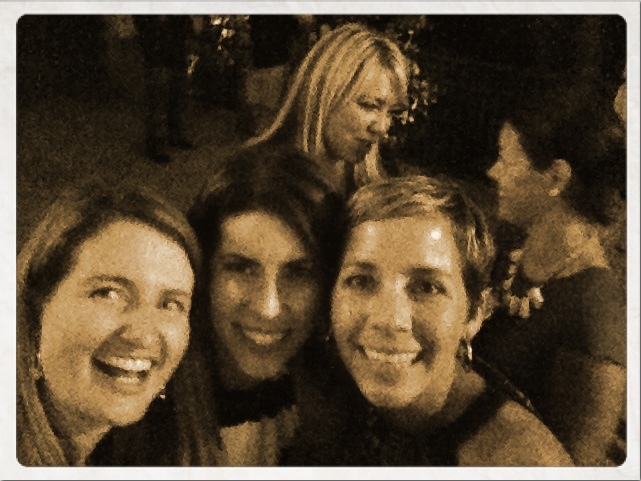 Then you’ve got reunion pics with girls I was lucky enough to grow up with. This one below? That’s my darling husband leading me through the streets of Granada. I’d follow him anywhere (almost). Ha! My first (and only, so far) trip abroad was to Guatemala- not so many lizards, but let me tell you about the spiders! Yikes! Eek, but I think I’m better with spiders. I say that now….Thx Patti! Thank you Carson!! Looking forward to seeing you too!! I was the exact same way about my reunion…telling people to go and then getting cold feet myself. I’m glad I went though – I would have wondered what I missed otherwise! Oh, good! I feel less crazy! Thx Staci! Congrats on what appears to be an amazing summer! Cool…thanks for the tip and thanks for reading! It’s amazing how other people bucket lists often jump start our own. Great post. Lovely post 🙂 I remember finding a little frog in my hotel bathroom in Morocco, quite a surprise too! But, like you said, you just come to terms with it after a while! Nice job….frogs are quicker than lizards! Thanks for reading and for your note! Yes! In five years….do it! Thanks for reading and for your note! That’s fantastic, they’ve already got a jump on things! Thank you for reading and for your kind words. Your writing is so fun to read!! Loved the part about using your college Spanish! I laughed really hard remembering my own college professors going on and on about how important it would be to know how to ask where the library and other obscure school places would be. Enjoy the rest of your summer…. it’s going by way to fast! Wow, thank you! Loved your note! Thanks for reading! Cheers! Great post! I recently got married and honeymooned in Brazil where Portugese is the primary language, then Spanish then English. A total of two persons on the entire hotel property spoke English but it was still so fun as I tried to remember my spanish and sign language the rest of it! Ooooh, congrats on your marriage! That’s awesome! Thank you for reading and for your lovely note! Cheers! Bwahaha! Muy importante! Gracias for your note! very nice of you post, sob. Nice Post…a trip overseas is a good way to knock off the bucket list…and to grow it. ‘Ive just comeback this week from four months around North Africa Middle East and Eastern Europe. My bucket list is much bigger. I sense more travel LOL! A never ending cycle! Wow! Sound like an amazing trip! Thanks for reading and for your note! I am so glad you laughed! Thank you! 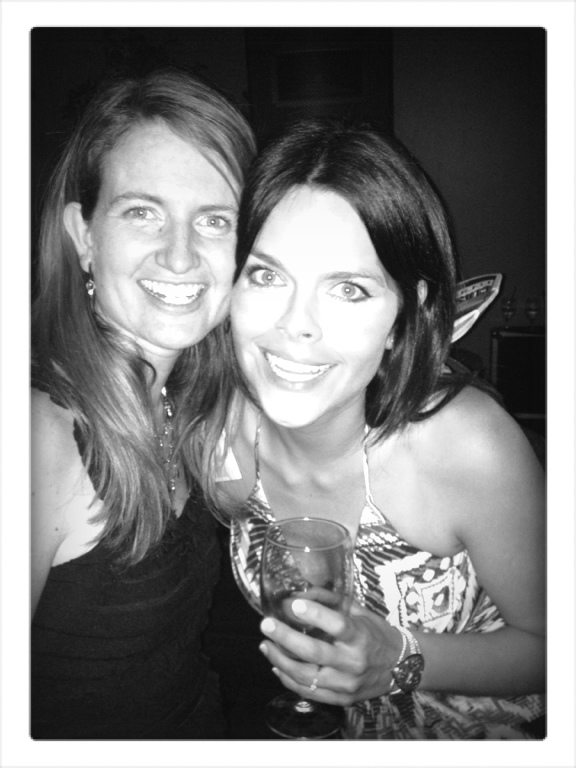 I flaked at my ten year reunion…and I don’t think I regret it. i wasn’t at a point in my life where I could be proud enough of my sccomplishments to answer questions about them. That’s the weird thing though. With facebook, we all know everything about each other anyway. Yet we still get nervous about the face to face stuff. It’s crazy. Good job!! They do bring up interesting issues….thanks for reading and for your note! I could relate to your bucket list activities. Enjoyed reading your blog. I remember my French teacher’s name though. Languages are taught within a more practical and cultural context these days. So I hope more people will remember their teacher’s names. I started my bucket list today. Thanks. Cool, have fun with your list! Thanks for reading! What an entertaining read! While I’ve never been to Central America, I can relate to having done/accomplished some pretty major things I never planned to or I thought I would do. I love the way you’ve presented the concept. Kudos! Thank you so much, for checking out my blog and for your lovely note! And now you can check “Get Freshly Pressed” off the list, too! Congratulations. And what a fun read. Well-deserving of the FP! Maybe you were living part of MY bucket list. I love Central America, but like you, heard scary things before I went. Sandinistan Army? HuH? I went anyway. I loved Nicaragua. And I loved Canada, too. Add that to your real bucket list, eh? Hahahahaha, live it. Thanks for reading and for your note! I love this! Thank you for sharing! I’m a big believer in stepping outside of comfort zones, and you’ve encouraged me to do that more often. i had the same lizard experience! thanks for sharing!! How fun! It feels like you get a glimpse of lizard soul….thanks for reading! The lizard story is so cute. I had a similar cockroach one. We ended on a somewhat amiable note. Hahaha, I’ll take the lizard….I guess. Thanks for reading! So so true! Thx for reading! Hey Colleen! debbie jones here. I too think that everything about our trip to Nicaragua- the wedding , the lizards, the sounds and smells of Nicaragua – church bells with competing gongs, fireworks, horses clipclopping, friendly car horns beeping- and of course the 5 hour wedding dance !!!! 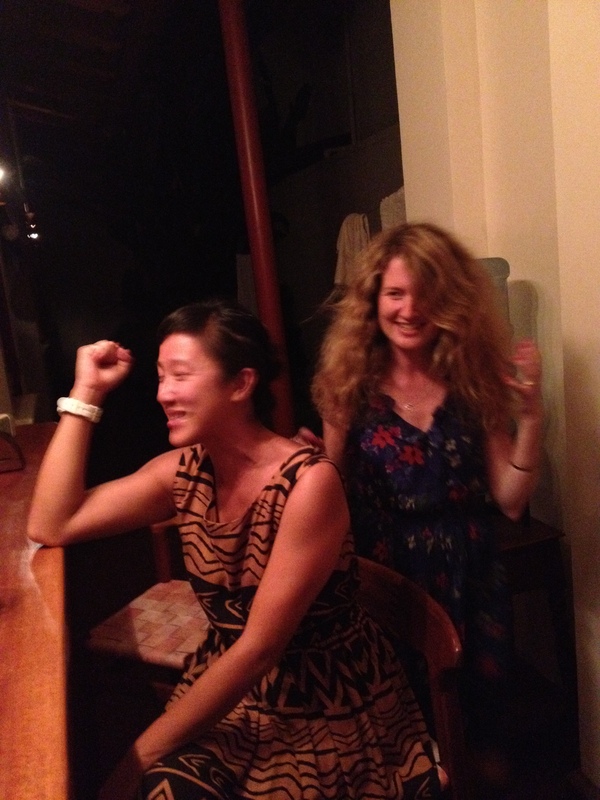 (your hair and your moves were awesome)- let’s do that whole dance again somewhere in the world ! Colleen, so when are you going to tell the REAL story of your incredible PERFORMANCE ART on the Dance Floor in Granada? The image of Janis Joplin rocking it (complete with hair swings) at the 1967 Monterey Jazz Festival comes to mind. You took a piece of my heart, baby! Peace, love, and more rum on the dance floor! I’m so sorry for the delay in my reply. My Internet continues to be wonky. I want to thank you do much for taking the time to read an for your very kind comments! Hope all is well and you are enjoying the waning days of summer! Cheers! This is certainly not my bucket-list, but thanks for going to the high school reunion. I wondered about my own, but actually didn’t follow it on Facebook and just skipped the whole thing. Glad you had fun. Lizards can be cute — if they don’t move and are smaller than your hand. Thank you so much for reading and for your fun note. Cheers! Hi, love this post. I’ve added you to my ‘inspiration’ page on my blog 🙂 hope that’s okay. This is an awesome bucket list and you’ve accomplished so much this summer! Great post and huge congrats on getting Freshly Pressed! Wow, thank you….for reading and for your note!